Glistening micro-crystals of willemite from Serpa Portugal. 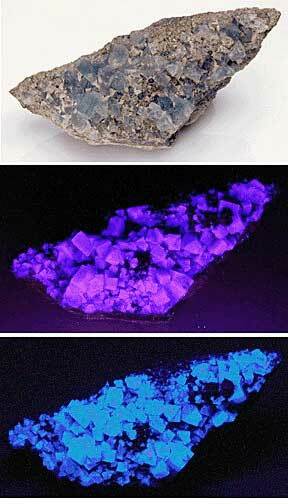 Willemite fluoresces blue-gray. It weighs 1.5 oz and is 2.4 x 1.8 x 1.3 inches Willemite crystals from Tsumeb, Namibia (SW Africa). 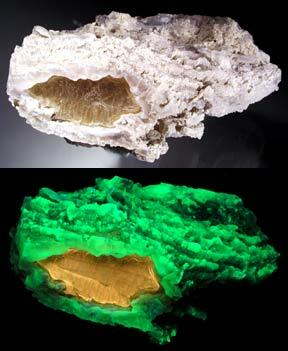 The willemite fluoresces pale green-yellow SW. It weighs 1.9 oz. and is 2.4 x 1.0 x 0.8 inches. A banded rock of chondrodite, aragonite and calcite from Long Lake zinc mine, near Parham, Ontario. The chondrodite fluoresces pale yellow SW. The aragonite fluoresces two colors - peach and pale blue SW and pale white and pale blue LW. The calcite fluoresces orange-red SW.
A corundum, var. ruby, crystal on marble containing green fluorapatite and phlogopite from the Kurakuram Mountains, Pakistan. The ruby fluoresces red SW & brighter LW. 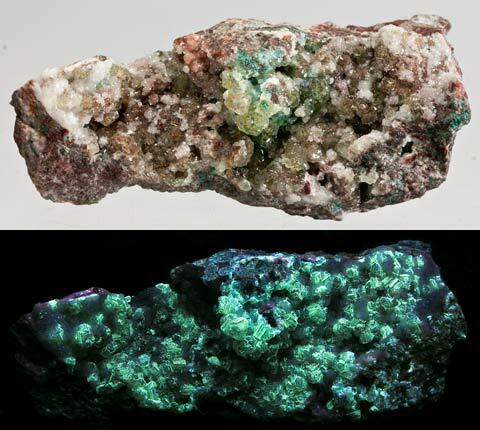 The fluorapatite fluoresces pale blue SW and the phlogopite fluoresces pale yellow SW.
An incredible gem green spodumene, var. kunzite, from the Kolum district of the Nuristan region northeast of Kabul, Afghanistan. 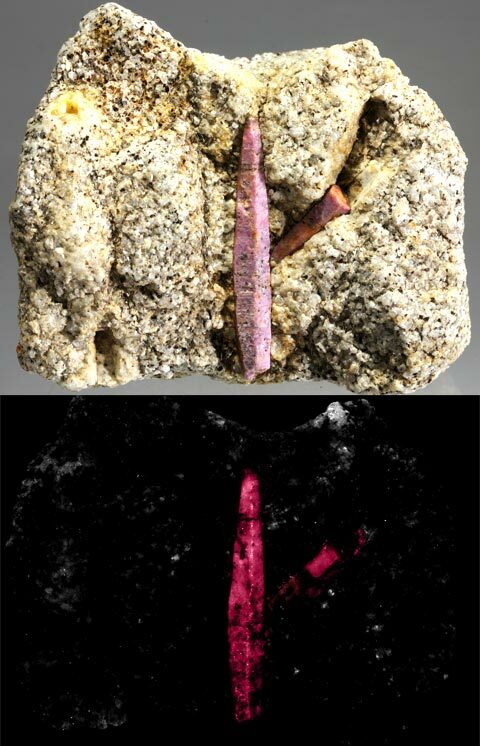 The kunzite fluoresces pink SW and orange LW. The piece is 1.5 oz and is 1.9 x 1.1 x 0.8 inches. Rare crystals of blue sodalite, clinohumite, phlogopite, and an unknown mineral in calcite from Sari Sung, Kokcha Valley, Badakhshan Province, Afghanistan. 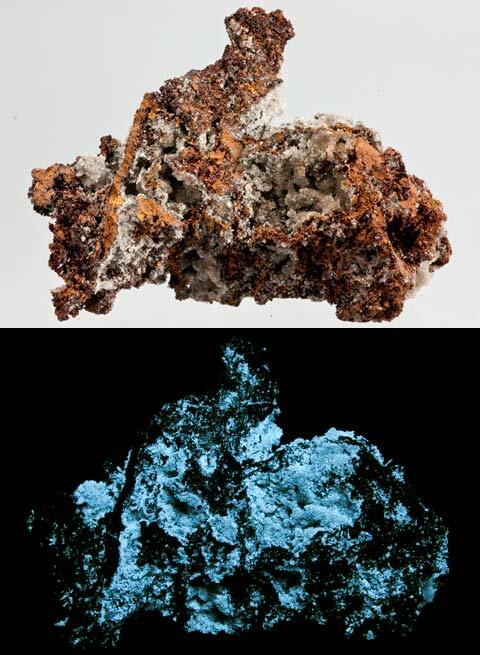 The sodalite fluoresces orange LW (bottom photo). 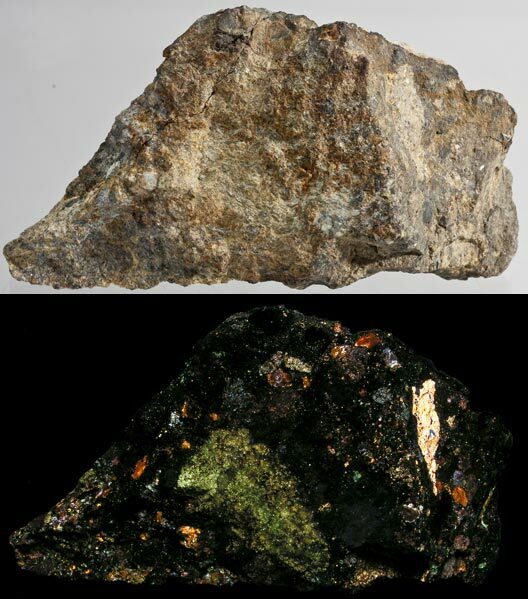 Clinohumite fluoresces yellow SW (middle photo), an unidentified mineral fluoresces pale gray SW, phlogopite fluoresces bright yellow-orange SW. It weighs 7.0 oz. and is 2.6 x 2.0 x 1.5 inches. A superb honey colored gypsum, var. 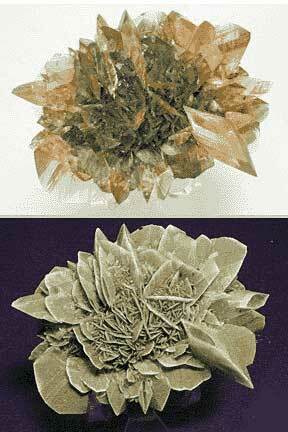 selenite, crystal rose from the Red River floodway, Winnipeg, Canada. 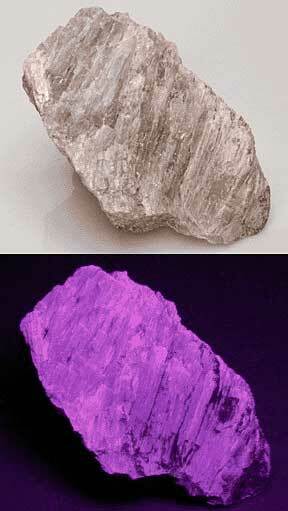 Selenite fluoresces grey SW and has a blue phosphoresence. Sometimes the selenite blades are "twinned", that is they look like a duck's bill and are, not suprisingly, called duck billed selenite. Not all selenite fluoresces under UV. This example is also great to look at under daylight. Zincite crystal "tree" from the chimneys of the zinc smelter in Silesia, Poland. Mostly green with tinges of red at the base. When they were knocking down the hundred-year old zinc processing plant, they found that incredible zincite crystals had grown in the chimney of the smelter. 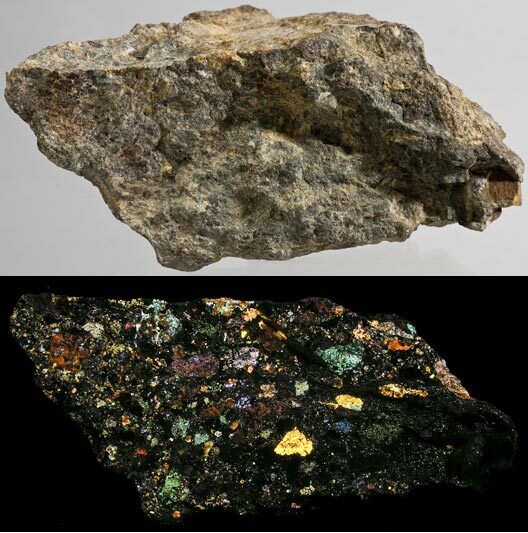 Most finds are individual crystals (some are cut into faceted gemstones). This unbroken "tree" of crystals is an exceptionally beautiful and rare piece. There is also a red variety that is usually not fluorescent. 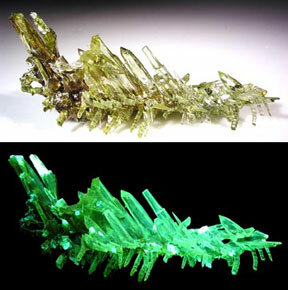 The zincite fluoresces light green LW. (Note: There are so many examples of zincite from Poland, nowhere as nice as this, that the story of the chimney-find is a bit hard-to-believe). 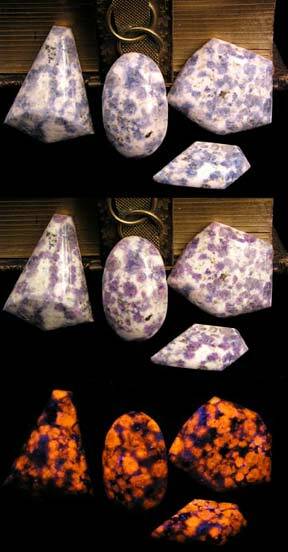 Below left are 4 cabochons of blue sodalite from Mont Saint-Hilaire, Quebec, Canada. Sodalite fluoresces orange LW and is mildly tenebrescent. It turns purple after being exposed to SW UV. 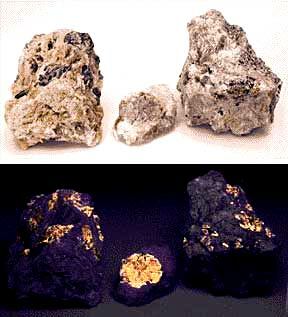 On the right is a group of 4 cabochons of hackmanite with natrolite, from the Kola Penninsula, Lovozero, Russia. Hackmanite fluoresces orange LW. It is extremely tenebrescent (turns grape color on exposure to SW). This grape color disappears when the piece is exposed to sunlight. The lower third shows the orange fluorescence LW. Leucophanite crystals and polylithionite on albite with rhodochrosite crystals from the Poudrette quarry, Mont Saint-Hilaire, Quebec, Canada. It weighs 2.0 oz and is 1.6 x 1.3 x 1.0 inches. 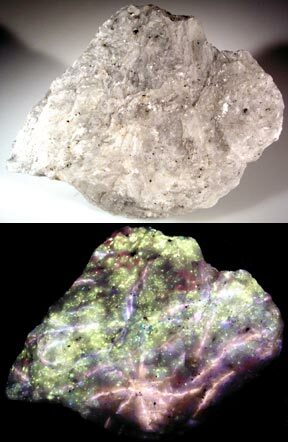 Leucophanite fluoresces lilac purple SW & LW, albite fluoresces cherry red SW, and polylithionite fluoresces yellow SW. Agrellite (pronounced "aah-grell-ite") from the Mt. Kipawa Complex, Sheffield Lake, Villedieu Township, Quebec, Canada. 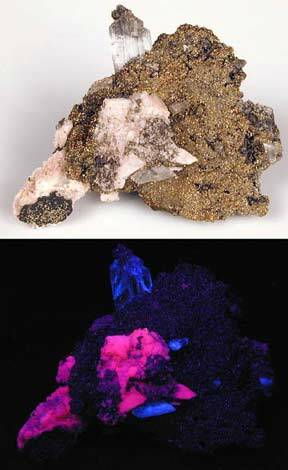 It has an easily identifiable lavendar-pink fluorescence SW.
Below left is calcite and gypsum crystals on a bed of golden pyrite crystals from N.B.H.C. mine, Broken Hill, NSW, Australia. 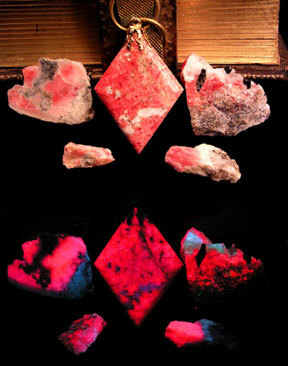 Calcite fluoresces pink-red SW and the gypsum fluoresces pale blue SW. 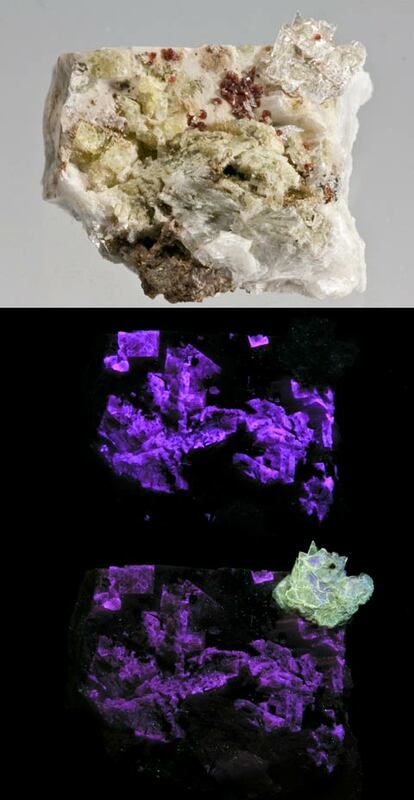 The three photos on the right are green fluorite from the Weardale district, Durham County, England. Most fluorite fluoresces violet LW. The mines of England produce some of the nicest fluorites in the World. They generally fluoresce very nicely under SW light but brighter under LW. Gem quality tugtupite. 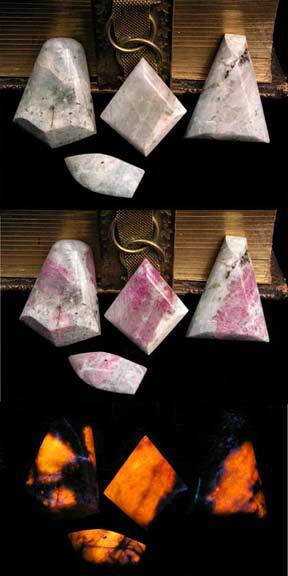 Tugtupite is a pink glassy crystal that fluoresces cherry red SW and red-orange LW. The color in some tugtupite bleaches out in sunlight and it regains its red color again when exposed to SW UV. Some tugtupite also glows white SW. The best gem variety tugtupite comes from Kvanefjeld, Ilimaussaq, Greenland. A more porous (less suited to gem making), but equally fluorescent variety comes from Tasaq, Greenland. 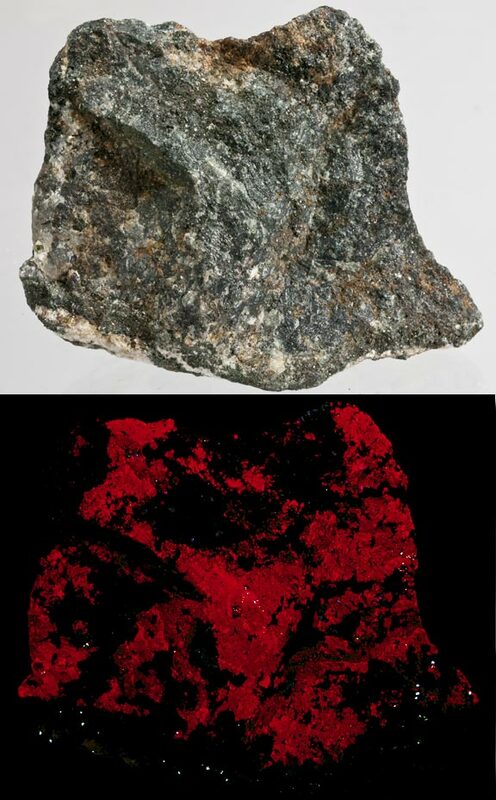 Rare, deep, cherry-red-fluorescing eucryptite with scheelite from Xianghualing mine, Linwu Co., Hunan province, China. This is older material that almost covers the piece on both sides. 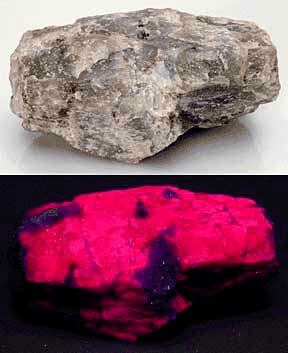 The eucryptite fluoresces deep cherry-red SW. It weighs 5.8 oz. and is 3.0 x 2.5 x 1.2 inches. The pieces are from Maine and Connecticut. The first is manganoan fluorapatite (known to collectors and dealers as manganapatite) from Bennet quarry, Buckfield, Maine. The manganapatite fluoresces yellow SW. The middle piece is manganapatite from Strickland quarry, Portland, Connecticut. The last is manganapatite in feldspar from near Tamminen quarry, Greenwood, Maine. Eucryptite from the Parker Mountain mine, Center Strafford, New Hampshire. Eucryptite fluoresces a wonderful cherry red SW.
Books #3 on Flashlights, Picture Frames & Halley's Comet | Ghosts In The Cemetery| Waffle Recipes| Links Copyright 2008 & 2019 by Stuart Schneider. Do not use any parts of these pages without written permission.